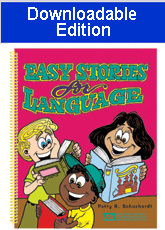 Ages 3 through 7 The stories and activities in this book are designed for children who experience difficulty answering simple questions, focusing attention, or describing a sequence of events. Stories relating to familiar situations such as going on a picnic, brushing teeth, riding a train, etc. are included. Each story is between 50 and 100 words in length. Questions are asked during the telling of the story and following completion of the story. Pronouns, present tense verbs, wh-questions, and basic concepts are emphasized. Short sentences are used in the stories. The short stories are divided into two sections: (1) Everyday Activity Stories and (2) Sequencing Stories. Large pictures accompany the stories that can be used for coloring activities. The lessons build listening comprehension, vocabulary, grammar, and oral expression as students participate in motivating activities.